You are here: HomenextPeoplenextLocal folknextRemember the Kemp Town Pram Race? 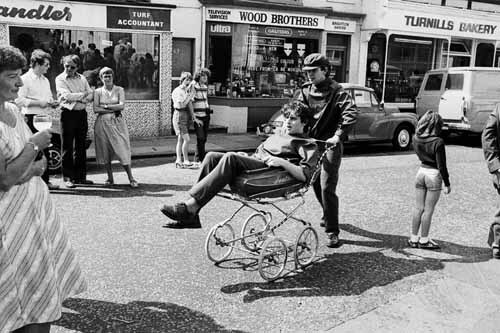 As part of the 2014 Brighton Photo Fringe I worked on an exhibition of photographs that I took in 1979 & 1980, mistakenly thinking that 1979 marked the start of what became an annual pram race event. In fact, as I found out, it started back in 1977 and ran through until 1989, a period of thirteen years. At the time the photographs were taken I was involved with a community arts project in Kemp Town and it seemed fitting to document local activities in the area. Identifying pubs willing to be part of the exhibition trail was an interesting experience. Initially I met with little knowledge of the event , but gradually discovered people who did know, and they have been very forthcoming with their memories and memorabilia, helping me fill in the gaps in the history. The pram race started at the hospital car park alongside the Eye Hospital in Eastern Road. The Audrey Emerton Building now stands on that site. The prams exited the car park going behind the outpatients department, now built upon, and along Great College Street. From there they arrived at the first pub on the circuit, The Wellington, now The Ginger Dog, to Clarendon Place visiting The Black Horse;The Eastern; The Star in the East; and The Stag Inn; all no longer in existence. From here they went towards Upper St James Street, to The Crown, and The Lion (now The Sidewinder), before returning via The Hand in Hand and then back into the centre of Kemp Town. Next stop was The Burlington, now The Thomas Kemp, The Golden Cannon and The Barley Mow. On leaving the Mow the racers continued east, turning right into Paston Place, visiting The Bristol Arms before coming back up into St George’s Road, to The Hanbury Arms (now the Proud Cabaret). The penultimate pub on the circuit was The Somerset Arms, later The Dragon, now a café. The final stop was The Sudeley, now The Saint George’s Inn, in Sudeley Street, before returning along Sudeley Terrace to the finish line at the hospital car park. A total distance of around a mile.